Za Restaurant takes reservations, sort of. Unfortunately “sort of” is kind of sucky when it’s 20 minutes past your call time and you’re standing by the hostess booth, gnawing on your menu. The day after our dinner, when I remembered how frustrating it had been to watch large groups led to their tables while we silently pondered the meaning of the word “reservation,” I called to clarify the policy. “We only do call ahead reservations,” they told me. I’m still confused. I called ahead, and I made a reservation, and the hostess said it would be fine. What? But on to the food. Za makes a big deal about its composed salads, but the Butternut Squash special tasted as if it had been infused with smoke, or some chemical. Maybe the composing mold wasn’t properly rinsed? Fortunately the Avocado Salad was great, but would have been better as a guacamole. The pizza with shiitake mushrooms and truffle oil was good, though in need of salt. The basic pizzas were fine, but not notable. 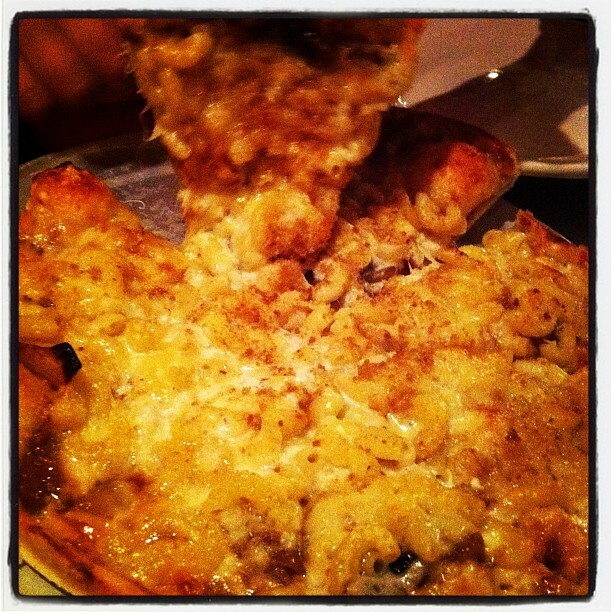 However, the Mac and Cheese Pizza is definitely a reason to brave the trying yet pleasant atmosphere at Za. Noodles on pizza dough is not usually the kind of thing you can perfect at home, and it is pretty unique. Finally, we did learn – during our annoying, reservation-flummoxing wait – that Za is a popular take-out place. At least 4 people picked up pizzas in the span of 30 minutes. I think that’s the secret to this place: get in, get out, get the Mac and Cheese Pizza.